The jewel of the southern garden, camellias are one of the most versatile and showy shrubs for your landscape. With the right insight and planning, it’s possible to have a camellia garden that blooms from fall until spring depending on the varieties you choose. Today, we’re going to focus on the fall-blooming varieties of camellia and highlight some of the top choices you can find right now at Meadows Farms Nurseries. Camellia japonica is the spring-blooming varieties of camellia that begin their bloom cycle in late winter and continue through the first part of spring. For today’s post, we’re interested in Camellia sasanqua, the fall-blooming varieties that begin their blooming in late fall and continue into the first part of winter. So long as you remember these names, you’ll never make the mistake of buying a spring-blooming camellia when you meant to buy a fall-blooming one. Fall-blooming camellias are generally hardier than their spring-blooming cousins, as well as being more drought and disease tolerant. While most camellias prefer light shade, fall-bloomers can tolerate more sun than spring-bloomers. It’s not all rosy for fall-bloomers, as they tend to be smaller, both in growth and in flower size, than spring-blooming varieties. Here are some of the best fall-blooming camellias carried by Meadows Farms Nurseries. Please note that inventory varies between locations, so please contact your closest Meadows Farms location for availability information. This newer addition is a vigorous grower with medium-sized, formal white flowers that bloom in abundance. Autumn Moon is an upright yet compact grower, with a height of around 8-feet but a spread of only around 3-feet. It can work as a foundation or hedge planting but can even work in a container. This variety has lovely peony-shaped deep pink flowers and rounded upright growth. It can grow anywhere from 4- to 6-feet in height with a similar spread. 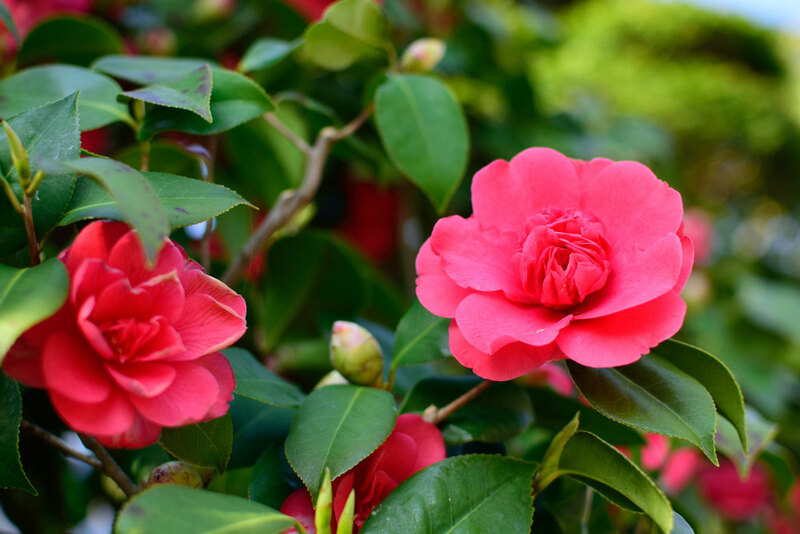 This fall-blooming camellia comes loaded with fuchsia-red, medium-sized, peony-like blooms. It’s spreading habit makes it ideal as a hedge planting or a large foundation planting. Grows to about 4-feet tall but spreads around 8-feet or more, so make sure it has room to grow! Lovely wavy-petaled, semi-double blooms of light rose-pink with a yellow center adorn this vigorous fall-bloomer. Cleopatra can reach a height and spread of 6- to 8-feet. Upright, vigorous fall-bloomer with beautiful rose-pink blooms that are great as cut flowers. Make sure to leave plenty of space for your Kanjiro to grow. It can reach an average of 8- to 10-feet tall and wide. Prized as being one of the best varieties of camellia for cold hardiness, the Survivor can handle most of what our climate can throw at it. Small, single white flowers with patches of pink on the sides adorn this upright camellia, which grows 6- to 8-feet tall and around 5-feet wide on average. This fall-bloomer will likely get you into the Christmas spirit with its deep red blooms complementing showy green foliage. Yuletide camellia grows to around 6-feet at maturity with a 4-foot spread. Do you have any Survivor or Autumn Moon in stock in Fred’burg? Hi Cheryl. As of this morning, we have 3 of each variety listed at our Fredericksburg store. They are in 3-gallon sized pots. I would certainly call them to verify that at 540-786-8171 just to be 100% sure before taking the trip out.